With a brisk but steady growth, Hong Kong’s design industry has been opening numerous doors to gifted, young individuals. Misconceptions of the restricting Hong Kong markets have been broken, and opportunities to advance into the global market has surfaced. Yet, in this fast-paced and multifaceted city, each local designer must obtain a unique and attention-capturing quality in order to keep their heads afloat in such a competitive market. As local talents strive to incorporate a sense of ‘home’ in their works, we often see both the chic, monotone city style of the downtown Central, combined with the unique colour of the beautiful Kowloon. Case in point would be Yi-Ming, a Hong Kong model-turned-designer, who incorporates the color schemes of the Hong Kong modern architecture and the nightlife in her sophisticated cheongsam pieces. In my opinion, her contemporary twist to the traditional garment is both easy to wear and super fun. Not to mention, another local fashion label ‘Louella Odié’ by Lauren and Karen Mead is also one of my favorite, as their pieces juxtaposes a modernist style with the natural textures of Hong Kong. Apart from being inspired by the city of Hong Kong, a lot of local designers who have studied abroad are also coming back to start their business, where the influences that they have received from around the world – such as from fashion frontlines such as New York and London – starts to come into play within their creations. Tangram, an established local clothing label, exemplifies an international mix of designer Paola Sinisterra’s colourful hometown Colombia, with Hong Kong’s cosmopolitan monotones. Even though local designers and creators are constantly keeping an eye out on the ever-fluctuating state of the economy and the world’s consumption patterns, presenting fresh and lingering trend of minimalist sport brands, as well as the widely consumed “fast-fashion”, which is endorsed by celebrities and social media trendsetters strikes the local designing scene; creating a mark in the Hong Kong fashion and creative industry remains to be a difficult task. Although Hong Kong’s liveliness fuels the rapid nurturing of creative business development, the struggles of fresh fashion start-ups hit home hard. For newbie designers and fashion people, ZALORA’s ‘Love Local’ campaign is a great opportunity. 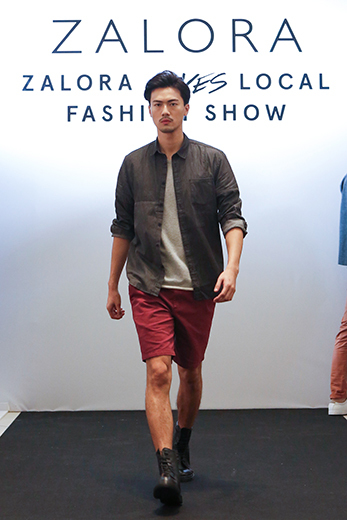 The fashion preview held at Tsim Sha Tsui’s Miramar Shopping Centre in October 2015 has showcased the works of four innovative local designers. In particular, the works of 112 mountainyam has caught my eye. The compelling inspiration of the independent woman and feminine power in his works are especially relatable. The dapper geometric patterns and minimalist colour palette reflected through his clean-cut apparels represent the sophistication and the hard-working attitudes of the Hong Kong working women adequately. The numbers ‘112’ also represent his unwavering loyalty to the solid pantone colours and a hybrid between futuristic and naturalistic. These are elements that accentuate the individualistic mindset and values of the Hong Kong people, as well as their constant pursuit of perfection. However, one must remember that even though Hong Kong’s fashion industry has been flourishing in the international market, it is still beckoning for the aid of public and private institutions from various sectors in order to reach its full potential. Funding has become a persistent worry for fresh designers, as rents soar a midst the already tight-packed population. It is especially frustrating that the absence of space to develop and experiment with both designs and market options hinder local start-ups and their creative expression. How will Hong Kong’s creative and fashion design industry develop in the future? I hope to see the pop of new talent in the dynamic local fashion industry give rise to a newfangled interaction between creative veterans. With conversation comes innovation, and this synergy will hopefully lead to an advancement in the local scene – one that invites the attention and recognition towards the tremendous talents that Hong Kong houses.